Now that we have a good feel for the nature of orbital motion—essentially a spacecraft is in a state of free-fall under gravity—we can also achieve a similarly good understanding of the phenomenon of weightlessness. Weightlessness is something we see routinely on news coverage of manned space missions. (In this book I use the phrase manned space missions to mean flights involving people—both men and women. I know that the phrase may not be quite politically correct, but I dislike the other possibilities, such as "crewed" missions or "peopled" missions.) We have become familiar with crew members floating about their space ships, performing tricks such as swallowing floating globules of water, which would of course be impossible back on Earth. Despite this familiarity, however, there are again misconceptions about the nature of weightlessness, but it can be easily understood in terms of objects—spaceships, astronauts, and globules of water—free-falling together in a gravity field. The key to understanding is an appreciation that all objects, independent of size and mass, fall with the same acceleration in a gravity field. The first statement of this principle is attributed to Galileo Galilei, who was born near the city of Pisa in 1564. To prove it, he is said to have dropped a cannonball and a wooden ball of the same size from the top of the famous leaning tower to demonstrate that the two balls would impact the ground at the same time, despite their different weights. Unfortunately, it is agreed by historians that this rather splendid story is of doubtful authenticity. A much better demonstration was performed on the moon's surface in July 1971, by Apollo 15 astronaut Dave Scott, who dropped a feather and a hammer together to see which of them would reach the lunar dust first. Since all three astronauts on this mission were serving members of the United States Air Force, the landing module was named Falcon, after the mascot of the U.S. Air Force Academy. The feather had to be that of a falcon, a detail that is of course entirely immaterial! You can perform this experiment now—if you happen to have a feather in one pocket and hammer in the other—but I think you can guess the outcome. Clearly the feather, being much lighter than the hammer, will hit the ground some time after the hammer in apparent contradiction of Galileo's assertion that all things fall with the same acceleration. However, the experimental method in this case is flawed; there is the unfortunate presence of air in the room—fortunate for you, but not for the experiment! 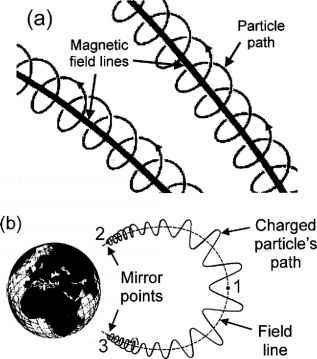 In the lunar surface experiment there is no air to influence the motion of the feather, and the feather and the hammer hit the dust at the same moment, giving a convincing demonstration that objects do fall at the same rate in a gravity field. We can gain an understanding of weightlessness in orbit in terms of the spacecraft, the astronaut, and all other free objects inside the vehicle all falling together with the same acceleration in Earth's gravity field. To consolidate this idea, we can attempt to do an experiment on the ground to reproduce the effects of weightlessness by replacing our spaceship with an elevator in a very tall building. Strangely, the elevator is equipped with a weighing machine, as shown in Figure 2.2a. When we enter the elevator, while it is stationary, we can climb on the weighing machine, and we know that it will register our normal weight. We also have sufficient experience of riding elevators to know that, if we were to press a button to go up, we will feel heavier while the lift cable is accelerating the elevator upward—the weighing machine will register this increase in weight (Fig. 2.2b). However, the part of the experiment to simulate weightlessness (Fig. 2.2c) is not to be recommended, as it involves cutting the elevator cable while disabling the elevator breaking system! In this case, the elevator and all objects within it will free-fall under gravity with the same acceleration, giving the same effects of weightlessness as seen on a spacecraft but for a rather shorter period of time! distinction between weight and mass. 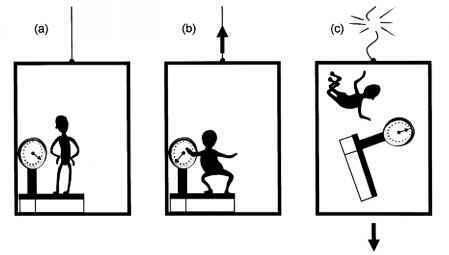 Our unfortunate elevator rider in Figure 2.2 may have a mass of, say, 80 kg (175 lb), which remains constant throughout his scary adventure, but as we have noted his weight varies considerably depending on the state of motion of the elevator. Mass, according to Isaac Newton, is a fixed attribute of an object that characterizes its inertia; massive objects like pianos require a significant push to get them moving, whereas smaller objects require much less effort. This difference between mass and weight also had a surprising consequence for the Apollo moon-walking astronauts, who found they fell over rather more often than they were anticipating. A typical astronaut's mass, including space suit and backpack, was on the order of 130 kg (285 lb), but of course their weight in the lunar surface gravity was around one sixth of their Earth weight. This difference meant that the friction between their boots and the moon's surface was similarly reduced to one sixth of that on Earth. As they moved around on the moon's surface, sometimes quite rapidly, they had less contact friction with which to manage their significant mass—with some interesting results! Why does in freely falling lift a person feels weightlessness?